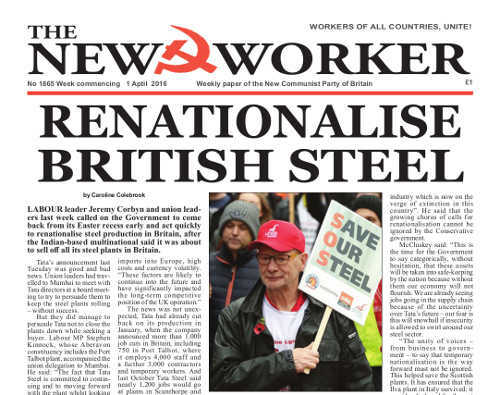 LABOUR leader Jeremy Corbyn and union leaders last week called on the Government to come back from its Easter recess early and act quickly to renationalise steel production in Britain, after the Indian-based multinational said it was about to sell off all its steel plants in Britain. Tata’s announcement last Tuesday was good and bad news. Union leaders had travelled to Mumbai to meet with Tata directors at a board meeting to try to persuade them to keep the steel plants rolling — without success. But they did manage to persuade Tata not to close the plants down while seeking a buyer. Labour MP Stephen Kinnock, whose Aberavon constituency includes the Port Talbot plant, accompanied the union delegation to Mumbai. He said: “The fact that Tata Steel is committed to continuing and to moving forward with the plant whilst looking for a buyer... is absolutely critical. THE NATIONAL Union of Teachers (NUT) held its annual conference over the Easter weekend and voiced strong criticism of the Government’s plan to force all schools to become “independent” academies and to the increased testing of pupils, especially the very young. The NUT conference, meeting in Brighton, voted in favour of balloting for strike action in protest at the Government’s plan to force all schools to become academies within the next four years, contained in a White Paper issued at the same time as the budget two weeks ago. The plan would effectively do away with elected and accountable local education authorities. The Tory government claims these academies have more independence and they are not forced to keep to the same regime of standards and tests that local authority schools have to follow. MORE than six million workers will suffer a £37 cut in their monthly wage from 6th April due to a change to National Insurance (NI) payments made in George Osborne’s budget earlier this month. The change will save the Treasury £5.5 billion per year. So much for Cameron’s claims to be increasing wages for hard-working families! That promise made last autumn consisted simply of changing the name of the minimum wage and calling it the living wage — though it still bears no resemblance to a real living wage that would allow workers to live a reasonable life. It will not even keep up with rising housing, travel and domestic fuel costs. Now the Government is directly cutting wages again through raised NI payments. But this rise will not go to ensuring a comfortable old age. The pension these workers will get will be less than that paid to their parents in real terms and the age at which they will qualify is to be raised regularly until it is in their mid-70s. The burden of working on through those years when their health and stamina are declining will ensure that many never live to draw their pension at all — their pension contributions turned into a free gift to the state.